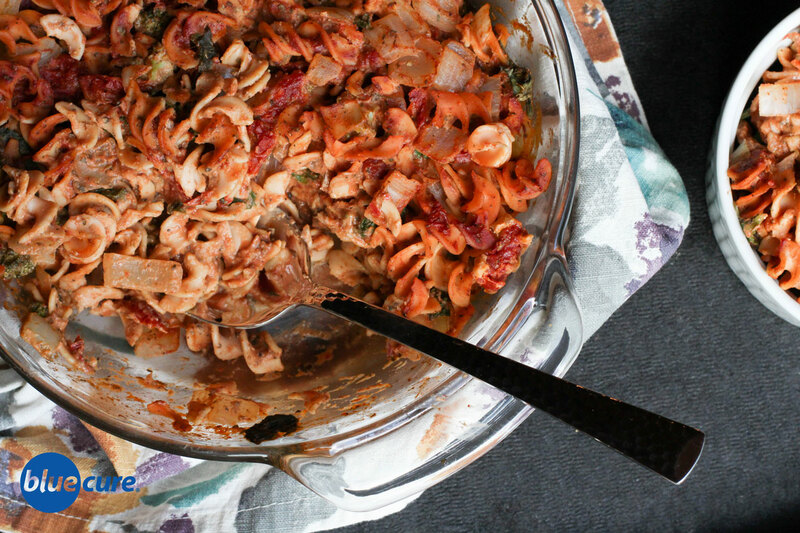 This tomato pasta bake is not only creamy and delicious, it’s also filling! 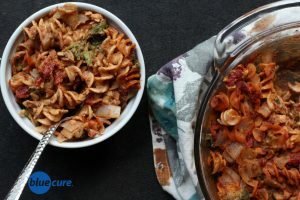 It’s a protein and fiber packed pasta bake. Using a bean-based pasta (one that has beans as the first—or only ingredient) makes this dish packed with protein! For example, 2 oz of lentil pasta provide ~12 grams of protein and ~10.6 g of fiber! Cashews are the base of the sauce, and make it extra creamy! Try using cashews to replace cream in recipes for a healthy plant-based fat. If you can’t get your hands on a bean pasta, substitute with whole grain noodles. Add 1-2 cups of cooked lentils to boost the plant-protein of the dish. Prepare the pasta according to the directions on the package. Preheat the oven to 350F. Wash and prep the veggies. Saute the onions in 1-2 tablespoons of water. Add the sundried tomatoes and broccoli. Continue to add small amounts of water, as needed to help keep the veggies from sticking. Add the greens and continue cooking until veggies are tender. In a blender, combine the tomato paste, cashews, basil, garlic, thyme, oregano, and 1.25- 1.5 cups water. Blend until smooth and add black pepper to taste. Pour the sauce over the veggies and stir in the noodles. Add the mixture to a baking dish. Bake uncovered for 20-30 minutes. Serve the dish with a side salad and enjoy!